Make use of paintball squads to win the game! Paintball is a rough sport but it is not always a physical game; more often, it is a mind game. While physical fitness and strength matters, a good strategy will also make or break your game. 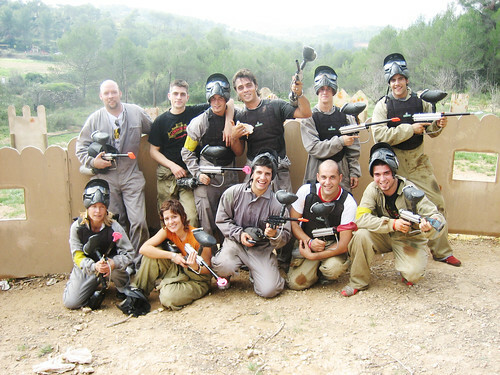 One of the most effective ways of playing paintball is to make use of squads; achieve this by dividing the paintball players into squads. A squad is a group playing to achieve a common objective and preferably made up of not more than six members. It is best if the squad members are disciplined and are quick in their physical movements. If possible, each squad member should be briefed on the team’s specific objective and must be advised how each member can help achieve this goal. Each squad member must realize that their movements are important to the team. Slow movement can be an asset when the enemy is near. Learning how to hide is also important to avoid getting hit by paintballs. However, what is more important about learning how to hide is that by doing it, the chances that you will be seen or fired upon by the enemy is diminished. A relative distance of at least five yards between squad members will make it more difficult for the enemy to see you. One of the most important traits in playing paintball is patience. Members of the paintball squad must not only use their physical agility to win the game, but more importantly their minds to make use of strategies that will help them win over their opponents. They must also learn to coordinate with each member to avoid being detected by their enemies. The team must be informed that it is best for the squad to fire as a group, making sure that each member is in the right position before firing. Squad members should support the other members who are being fired at by firing back; especially when they are in a better and more strategic position to do so. The most important thing is that the squad knows that they are playing for the team and that coordination and team work will be a deciding factor in winning the game. Remember, more heads, rather guns that are firing as one, are better – especially in paintball. Whatever you do, play as a team and you will certainly have the advantage over your enemies. .